The clouds stayed with us through much of the night at Machame Camp, but it was a treat to wake to clearing skies and our first views of Kibo -Kilimanjaro’s central peak- rising to impossible heights in the distance. We set out at 8 AM on a steeper and rockier track than yesterday’s trail. It was as if we were on an endless staircase through a forest of giant heather. We could see a layer of cloud a thousand feet below us, stretching to the horizons, and there was some cloud up near the top of Kibo, but we were in the clear for big chunks of our journey. 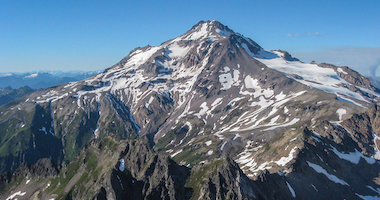 Our climb ended up being along the spine of a ridge radiating out -like a spoke in a wheel- from the central peak. We began a leftward traverse toward the Shira Plateau when the clouds caught up with us, making things a bit murky, but not as damp as our cloud-walking yesterday. At 12,000 feet, we began to pick out the giant senecios and lobelias endemic to Kilimanjaro and we got used to the large white-necked ravens performing crazy aerial maneuvers and waddling around on the ground to scavenge for food. By 1 PM we walked into our new camp at Shira at 12,500 ft and quickly got settled. Most enjoyed a good afternoon nap following lunch, but we all came out to watch the sunset and moonrise before dinner. Luckily the clouds faded away again and we could easily pick out Venus, Jupiter and Mars in the brilliant sky. Kibo was lit up magically by the moonlight. Word is that a lunar eclipse will occur between 2AM and 4AM tonight and several of the team vowed to take advantage of their lingering jet lag to get up and witness such a thing in this memorable setting. Keeping my daughter and her husband (Heather & Brian) as all the team and guide in my thoughts and prayers daily! Safe journey as you continue in your assent ! We’re down at 11,000 ft. We had lofty ambitions this morning but Denali played hard to get. There was a mean wind blowing through much of the night and sadly right through the morning. We waited it out as long as we could but called it at mid day. Tough as it was to let go of the summit, it was pretty obvious that it was out of reach under the circumstances. 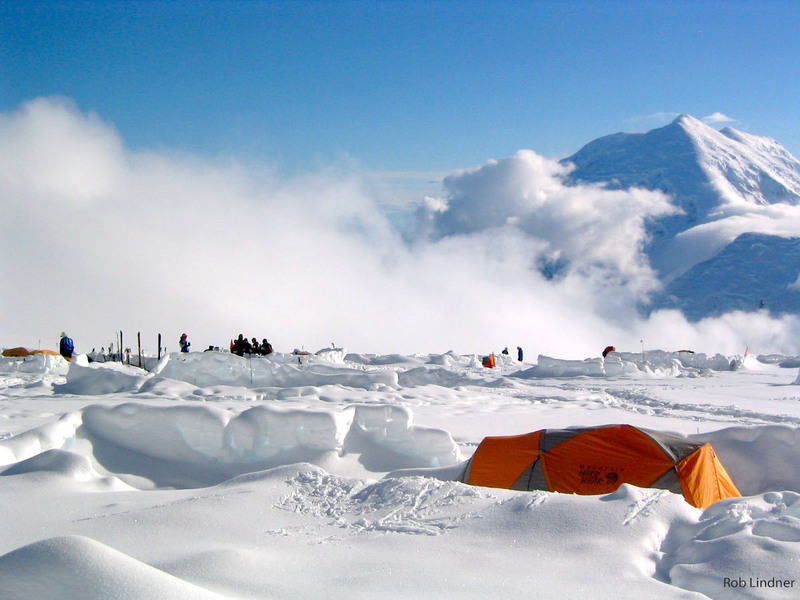 We broke camp at 17 and got moving down -as did every last climber on the mountain. A storm is moving in, according to the forecasters. For that though, today was spectacular once we were on the move. There is a bunch of forest fire smoke creating a haze, but we still got great views down to the Kahiltna Glacier as we carefully walked the ridge crest, dropped down the fixed lines, dug out our sleds at 14k and pushed on around windy corner with heavy loads. We piled on down the squirrel hills and motorcycle, and came into 11,000 at 9:30 PM. Our tents went up fast and dinner wasn’t far behind. The air down here is chock full of oxygen and it isn’t nearly so cold as we’ve gotten used to. We’ll get some low altitude sleep and plot our final escape to the airstrip soon. What an awesome team. 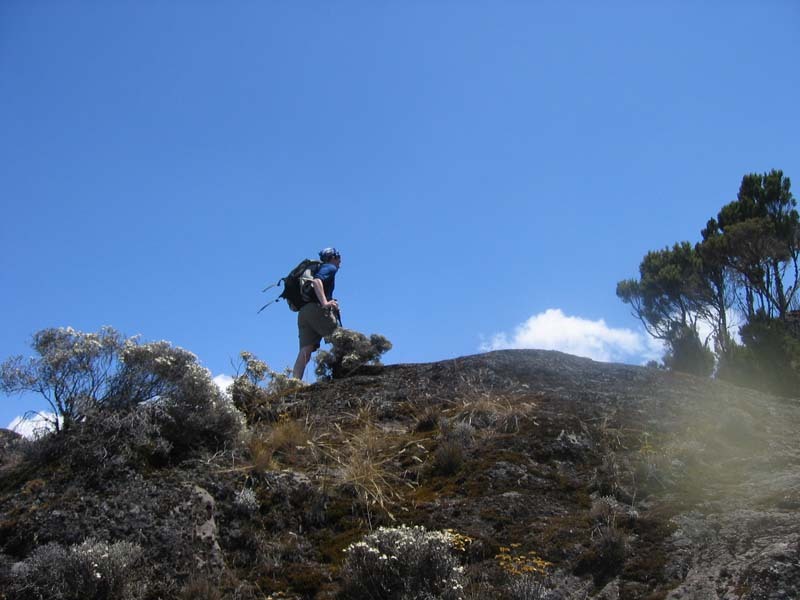 The best part of mountain climbing is being on the mountain and experiencing nature first hand. We are really proud of you all. 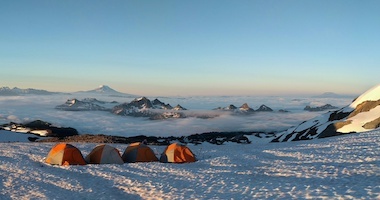 Today was better weather than we expected -after a snowy and blowy night- it was crystal clear and calm at camp when the sun hit, there was a sea of clouds below. But the winds were blowing up on Denali Pass and the South Peak until early afternoon which discouraged us from giving it a go. We’ve got reason to believe that tomorrow -Friday- will be our day. We chalked up another 17,000’ rest day and hope that the extra time up high has made us more ready for success. We’re definitely feeling a little more like our old selves now compared to when we first rolled into 17k. A short walk from camp to the big drop off and we can look down on the empty camp at 14,000’. The last groups of the season are here now and looking to take their shot tomorrow too. I’m hoping by the time I write this comment that you already summited on Friday. 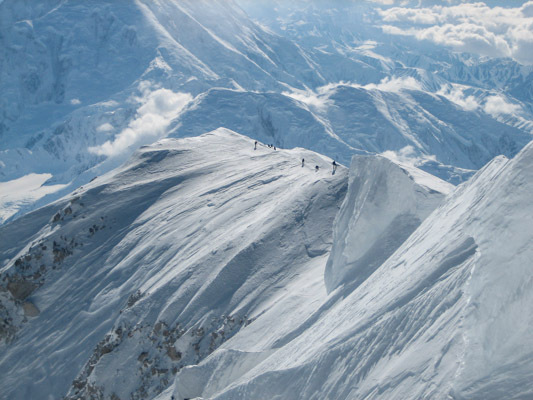 However, I’m no stranger to these climbs and understand she could take a few more days if conditions dictate…. All the best Tom. God Speed brother! The sun hit at seven. There were high clouds and some of the signs of the storm forecast to move in at the end of the day. We hoped to get lucky by sneaking the summit in before that storm. With that in mind we breakfasted and geared up… but not too quickly as we were still watching the weather. At 10:15 we made the move and left camp… at precisely the moment that three other guided teams left their own camps. The resulting traffic jam as the teams hit the steep and tricky first pitches of the “autobahn” combined with rapidly deteriorating weather had us turning back to camp before noon. We set to building walls around the tents and catching up on rest and hydration. The storm did hit… there were a few nervy hours in the evening trying to account for the teams that had gone onward and upward. All turned out ok in the end and we are secure in our fortress at 17,000’ Camp. We’ll climb when the weather improves. Sorry to hear about the weather turning you back. Hopefully today, 7/6, will be more fruitful by providing Scott his best birthday present ever! Be safe! We could see forever this morning, and then it got better. The high clouds were gone, the low clouds were gone and the middle clouds were gone. 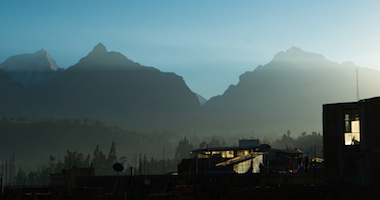 We were up at six and walking by 8:45 in the cool shadow of the South Peak. By noon we’d topped out the fixed ropes and were starting up along the phenomenal crest of the West Buttress. We never got anything stronger than gentle breezes, despite our exposed position. There were a few big smiles as the gang came up past Washburn’s Thumb and began to flirt with 17,000 feet. We pulled into the 17,200 ft camp in mid afternoon, six hours after leaving our Camp at 14,000’. Building camp was hard in the rarefied air, but we got it done and sat down to a six PM dinner in our newest snow dining room. We talked about how a summit day might work tomorrow and how to prepare tonight. We will need to get a little bit lucky on the weather, and everybody will need a good night’s rest… but then if it all works out, we’ll be ready to take advantage. Light, high clouds have taken over the western sky, but the sun is still powering through at 8:45 PM and we can see rivers, tundra, mountains, glaciers and planet Earth for hundreds of miles. I hope by now you have summited and are starting back down. Great job! Wishing you all a happy 4th! Send it Tom! RMI Super Crew 6 is safe and sound back in Talkeetna! I expected to be tired waking up early to head to Basecamp from our 11k Camp. I realized when you wake up at 11 pm it is either too early or too late to wake up tired! The tired came later. We had a beautiful night/morning finishing the 10 miles of glacier that delivered us to the airstrip. Denali gave us one more round of mini snow and wind before it finally gave us a moonrise and sunrise combo. We arrived at the airstrip just in time for the planes to start flying. We got all of our gear de-rigged and ready to throw on the plane when we were informed that the plans for us had just been changed and the pilots would be picking us up at the upper airstrip a 1/4 mile up glacier. Since the planes were already in the air, we loaded sleds and packs up Beverly Hillbilly style and made the trip in record time just as the planes arrived to bring us back to civilization. I really appreciate all of the hard work and great attitudes that the Super Crew brought to our adventure. Also, thank you for all of your blog comments and support. It made a huge difference knowing all of you had our backs! It’s the Love of adventure that make a person put themselves through such a grilling trial.. Testing yourselves to how much your body and mind can endure… You All have “shined” through it all and I’m so happy for the guides and happy for the determination of all the participants ... They will all be looking for New Mountains to climb now.. You are Truly a Super Team ! ! ! This was the day we were looking for. Even so, it looked a little gusty up high at first, so we dragged our feet a little and lingered over breakfast. The sun hit at 9:30 and we got walking at 10:30. 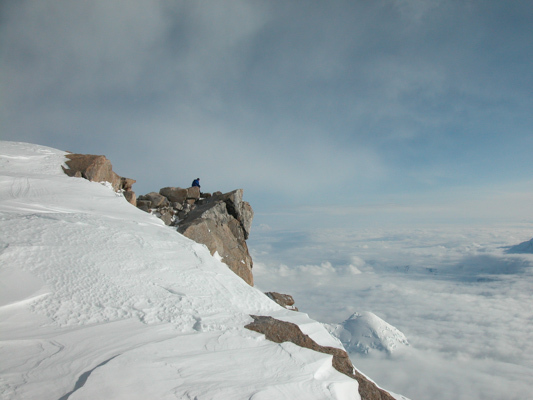 Our goal, of course, was to carry food and supplies up onto the West Buttress and to establish a cache that will help us when we commit to moving up to 17,000 ft. But our goal was also to get familiar with the steep part of this climb -the fixed ropes- and to build on our acclimatization by getting a good workout in at altitude. We did all of that today. Things were slightly on the crowded side, but that didn’t give us much trouble in the end. 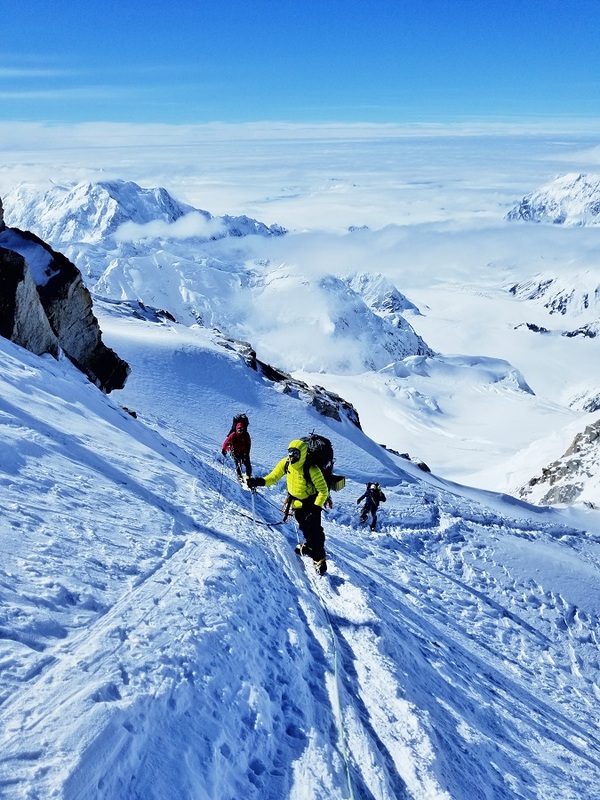 It is close to the end of the Denali climbing season, now that we are in July, but the last 100 or so climbers all flew on at once due to the five day storm that preceded our arrival. And we’ve mostly been on the same travel schedules since those 100 folks are all in various guided parties. But we know and like many of the people so it hasn’t -to this point- seemed so crowded. But all those folks needing to get on the same ropes to reach the crest of the West Buttress means that some patience will be required. We turned out to be patient today, waiting our turn, but it wasn’t so hard to be that way in sunny, pleasant weather and with fantastic scenery all around. The upside for us was that the teams ahead of us kicked a perfect staircase in the snow up the steep headwall. 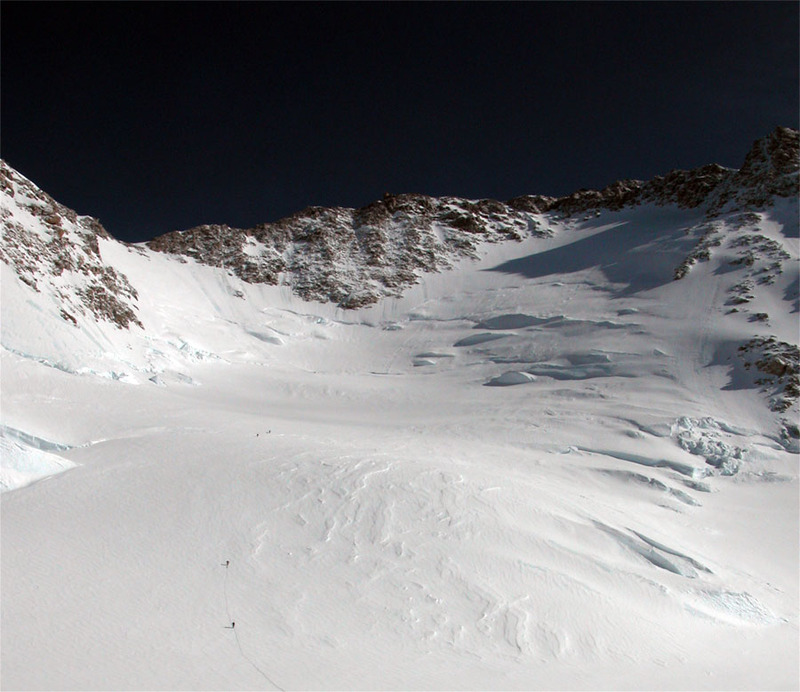 We topped out at 16,200 in surprisingly fine conditions -the exposed ridge crest can often be cold and windy. As it was 3 PM we declared victory and established a cache -burying it all to keep our supplies from the ravens. Our descent was smooth and easy since we now had the whole place to ourselves. We were back down to camp by 5 PM and relaxing over dinner a couple of hours later. Rest day tomorrow and then up for good. Glad your climb is going good! Hannah, looking forward to talking to you and seeing your pictures! The snow quit abruptly last night at around 11 PM after about a foot of new. Forecasts called for more snow today -about a 70 percent chance of it. So we were on our guard. 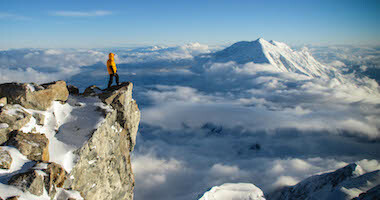 But this day dawned crisp cold and clear above us (with a sea of cloud below). For various reasons we opted not to pull the trigger on our carry today… there were traffic jams and a lot of new snow to wallow through. For exercise and a thrill, we roped up and ventured over to the “edge of the world” a rock outcrop at the edge of Genet Basin. 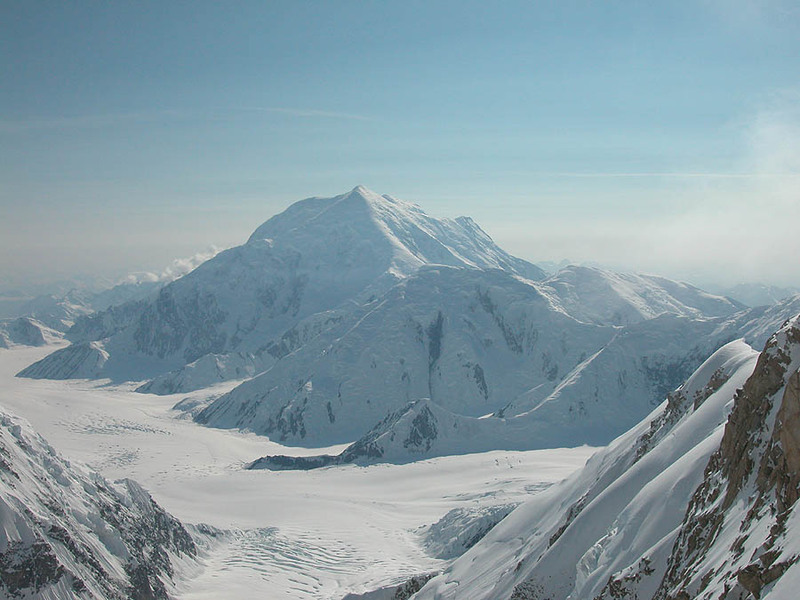 From that edge, the world drops vertically for four thousand feet to a branch of the NE Kahiltna Glacier. We stepped out to the apex of rock overhanging the drop and mugged for photos while the clouds swirled in and out mysteriously. The afternoon ended up restful and pleasant… and not so snowy. We’ll be ready to climb tomorrow. I cant imagine the experience and beauty you are all having! So Awesome! Climb high Tom! The weather clearing did not happen until late last night, so we could not make a break to Basecamp. The clear weather did make for a great rest day at 11,000’ camp. We slept in and enjoyed the sunshine while we gathered our strength for one long and final push to the the snowy airstrip. The team is in great spirits and ready to get back to summer and away from days filled with snow! Keep your fingers crossed for clear, flying kind of weather for us tomorrow! We’re on our way to Colorado! Finish strong, David and Super Crew 6! So ready to hear your stories and toast to your amazing journey. We are headed home… Slowly. 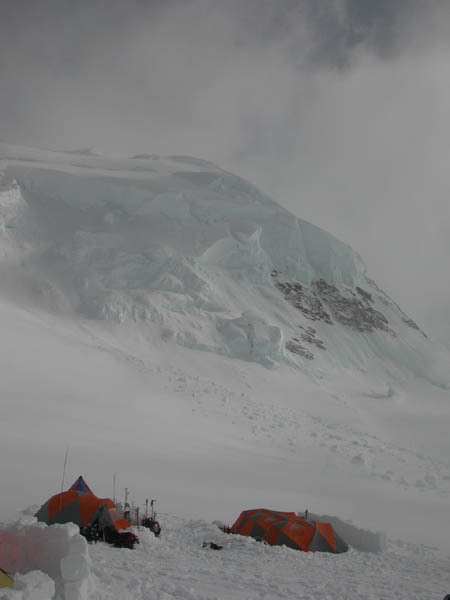 We woke up to pretty big winds and blowing snow at 17k camp this morning. Our desired early start turned into an afternoon departure when the weather finally gave in enough for us to descend. 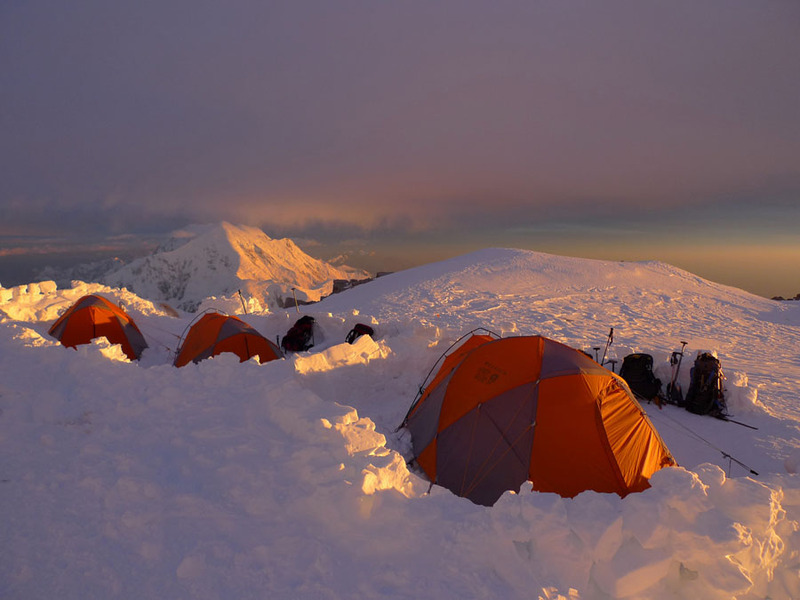 We had a great climb down to 14k camp where we crossed paths with Dave Hahn and his crew. It was great to see them and we hope they get the same kind of summit day that we got to experience! 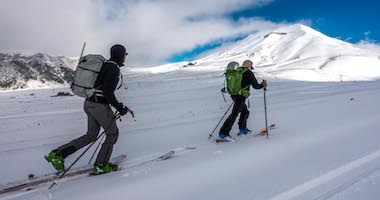 After picking up some cached gear and food from 14k, we made our way through some snowy weather to 11k camp. The Super Crew did a great job keeping it strong on this very long day! Even though the weather does not look to cooperate with us for a Basecamp dash tomorrow, we are in positioned to make it there when it is time to fly! I think I can speak for the entire Super Crew 6 when I say we are sick of snow! 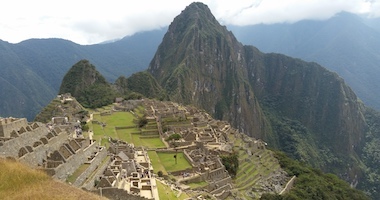 Proud for your accomplishment…...What an adventure, something that some people only dream about ! You had a Great Team of Mountaineers to be able to stay the course.. Have a safe trip home..
I’m so awed by this accomplishment. I plan to share the blog with my English students in the fall when they read the novel, “Peak.” Godspeed for the journey down the mountain.